Classic-Castle.com • View topic - Carts for new Castle! I would like to see a set in the $10 range include a cart or something of similar interest. 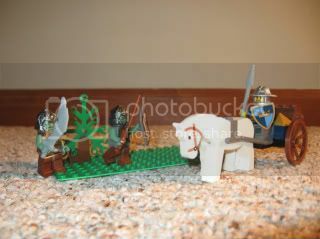 I know Lego wants conflict in every set, so it seems like it would be possible to give a Crown Knight a small cart like http://www.classic-castle.com/sets/archives/6010.html with some supplies and have a goblin or two ambushing him. This would satisfy the need for a battle, provide both sides with adequate figures (for army building), and give us an accessory which might be of some use somewhere else in our collections. I love the older carts Lego used to market, they just fit well into a midieval world. It would be hard to get Lego away from their love affair with seige engines, but I think there would be a great market for such a set... even though I dont like the goblins personally. Even kids like carts, or at least they did in my day, so it should appeal to Lego's target age group. How about an ox cart with a dwarf driver? Athos wrote: How about an ox cart with a dwarf driver? I actually thought that a human driver would be nice so as to appeal to people who like more realistic castle sets. Goblins attacking a dwarf would make it like most every other set in the 2008 line up. Honestly, I would even like it if it was a peasant driving. I came up with a prototype set using two forestmen and a crown knight. It was very Official Lego looking. I need to find a place to post the pics, then I will link them up here. I ordered the parts from Brinklink that I need to put the cart into a more organized crown knight color sceme. DerBum wrote: I need to find a place to post the pics, then I will link them up here. A horse and cart or one of those silly little push-carts with like 1 minifig? Knights need something to defend. Peasants are something to defend. Peasants need pitchforks. Therefore, in a roundabout way, knights do need pitchforks. Plus, pitchforks are just awesome. When life gives you lemons... Throw 'em back and demand for chocolate! How about a weapons cart? With a horse pulling it and 1 Crown Knight soldier accompanying it? JPinoy wrote: How about a weapons cart? With a horse pulling it and 1 Crown Knight soldier accompanying it? That would work for me. Maybe a weaponsmith to go with the Knight or a squire. I like this idea. I know that this is an old thread, but I finally got photos of my idea taken and online, so I thought I would post a picture here to illustrate what I am talking about. Image changed to link by admin. Do not post images larger than 400x300 pixels in the forum. I am not sure if this would fit into the $10 range, but if not one of the trolls could be removed and you would still have a useable set... I guess I would call it Treasury Cart, or Supply Ambush, or something like that. What do you think?